If you need to start speaking German Fast, but you don’t havea lot of time to study the language, German For Dummies AudioSet is the quick-learning solution for you. These threesixty-minute CDs feature fast, focused instruction that gets youquickly up to speed on essential vocabulary and language structure. Heading for Germany, Austria, Switzerland, or any other Germanspeaking country? 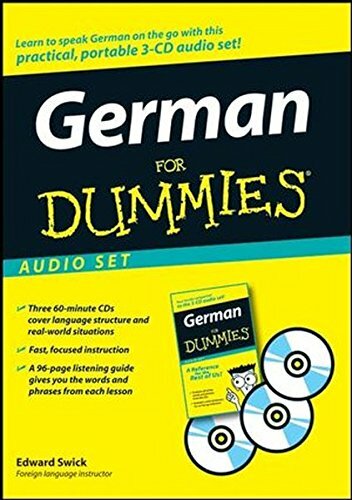 German For Dummies Audio Set is packedwith all of the must-have expressions and phrases, you need toconduct business or have a great vacation! If you have any questions about this product by Swick, Edward, contact us by completing and submitting the form below. If you are looking for a specif part number, please include it with your message.